Do you remember when I wrote that a lot of conferences are a waste of your time? One thing is sure - Pipeline Summit is nothing like that. Mastermind behind this event is the CRO of Brand24, Mick Griffin, and besides walking around in a lobster costume, he has set up some great ground rules for Pipeline Summit. First, he never invites the same speakers twice, and all the speakers are hands-on experts and practitioners. Next, the lineup is always international, to broaden participants exposure to different national circuits. Many speakers, including Polish, travel to conferences and present the same content many times, which for regular attendees means they cannot learn new stuff. This year’s main theme was #nomarketingbullshit, which is a statement I am fully on board with! The whole event was flawlessly organized, thanks to (among many) fantastic Tomek, you rock! The workshops and presentations we saw with Paweł during our visit were nothing short of excellent, and they deserve a short write-up. Day 1 was for workshops, and Day 2 of the Summit was dedicated to speeches, one of which was delivered by me! Check it out, ask questions and give me feedback, I really want to hear your input and to share experiences! I really hope your attention span is long enough to reach this part of the post – as per Bohumil’s from Kontentino workshop, average Facebook user’s span lasts only about 1.9 seconds! This is why building an instantly effective message that generates high quality leads is really difficult and requires skill. Quick take away – using the word “free” in social media posts can actually decrease the value of the offered product. Jack Moberger on the other hand, walked us through ins and outs of understanding the Buyer’s Journey. He explained in detail how following users who test your product gives valuable insights, and how to find the issues that stop them during trial periods. The effect is an improved conversion rate and faster reaction to problems users may not report on their own accord. Millions of words are put on paper every year about putting the customer first. But rarely have I heard it in such a precise and actionable way as when Agata from Booksy took the stage. Her presentation really hammered it home for me how much our job is to make the buyer’s experience amazing. The ringleader, Mick, was on stage, too. He showed us some dreadful examples of sales pitches, and diagrammed what exactly was so bad about them. So watch yourself – low quality pitching to Mick may land you on a naughty list on the next year conference 🙂 For those looking for great tips, go straight to Facebook group “How not to sell – Pipeline Summit” and engage there! At Bee Talents, we are very high on measuring every aspect of our enterprise. Bartek from Casbeg reminded everybody the truism that the things you do not measure can’t be managed well. And what baffles me, is that so many companies still leave so much of their activity in the “data-cellar”. Proper measurements give insights that we can transform into efficiency improvements! A nice quick lesson from Bartek would be to never ask your prospect about his precise budget, but to give him a clear (but negotiable if need be) spread – something like “The least you would have to spend for this solution is X, the biggest – Y. Are you somewhere in between?”. I feel this approach, let me know if it works for you! Sometimes I have a feeling, that we are all focusing on scaling up and automation too much. On the way, we lose the personal touch in our interactions with potential clients. Usually it’s a trade off – we either scale up and automate or we devote time for personalisation. Thank you Brenan for showing that one doesn’t need to compromise one for another! Finally, a snippet from Stephen’s lecture – “Your certainty as a Leader of sales reps has to overcome their doubts” – and I couldn’t agree more. 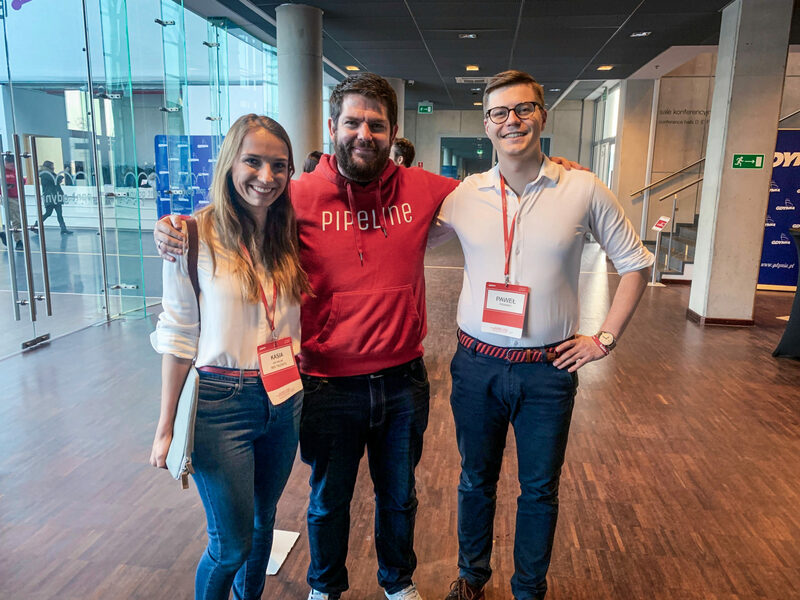 To summarize, Pipeline Summit 2019 was a blast, full of entertaining and knowledgeable speakers, and just nice people all around. My post covers only a fraction of what we have learned. So if you’re hungry for more – watch diligently for the next edition!